Since my last AAR using the 'Into Battle' rules for WWII hex based games, the rules have had some further tweaks, refinements and streamlining and are now pretty tight and ready for sharing. Indeed this posting session was intended to support their release, but something begged to be added. I recently picked up twelve 10mm Vehicles from Pendraken to round out my initial Rusian and German forces for circa 1943. Amongst them was the Sd Kfz 243/2 Puma armoured car, which was a last minute addition made to the order. After painting it up, I just wanted to get it into a scenario. It reminded me of the Matchbox 1/72 Puma model that I built as a teenager, which came with its own diorama (street scene) that made it rather unusual at the time and so I made a bit of an extra effort putting it together. Anyway, no doubt with that nostalgic aspect in mind, I wanted to build a scenario around this vehicle - making a total of 6 scenarios to go into in the rule book, which seems a nice round number. The following post looks at how the scenario took life and how it plays out in an AAR (plus news on the release of the rules). Please click on 'Read More' for the rest of this post. The scenario had to do something different than the other scenarios to justify inclusion with the rules, so an interesting situation was needed. Only 100 Pumas were built and they could reasonably be expected to pop up in a scenario from late 1943 into late 1944. Being allocated to reconnaissance units and having regard for the other units in my collection, I was left looking for an action that could see them in a forward probing role on the eastern front. Fifty percent of the production run went to Panzer Lehr and 2nd Panzer Division, both of which were deployed to the western front during the relative time frame. Wiki helpfully shows that 20th Panzer Division was given 16 Pumas. The division was also heavily involved in the Soviet summer offensive of 1944 (Bagration). It just remained to find an action in which they might typically have been used. After a little reading, the following seemed to offer an interesting framework for something different. Scenario 6 - Escaping Bobruisk. Late June 1944 and the southern arm of the Soviet summer offensive (Bagration) had almost encircled Bobruisk, a city that once taken would open the way to Minsk. Hitler's hold fast policy had prevented early evacuation of German troops out of the area and across the Berezina River and now the army was suffering terrible casualties from an overwhelming onslaught of artillery, air strikes and the ground offensive itself. On 27th June, 20th Panzer Division had been fighting on the outskirts of Bobruisk against 9th Tank Corps, when their position became substantially compromised as 1st Mech Corps advanced to surround them. The following day the panzers began to move northwards hoping to escape at a river crossing at Svisloch, some 20 Km away. First they had to break the encirclement at a point which they believed was still relatively thinly held by the enemy. And so the scene is set. The German attack is made at the point where the encirclement is at its loosest, though time is short and the ring is closing. The basis of the scenario is that the lead elements of the division (including the Puma) are pushing through a very weakly held sector. At the start of each Soviet Command phase, the Soviet player rolls on an 'Arrivals Table' to see what units, if any, will appear on the board that turn. I suppose this is something like one of those computer games where there are 'spawning' sites that cycle units into the game. Scenario special rules for the Puma have it always in command and it can always move 2 hexes if it wishes, giving it a bit of character in the game. 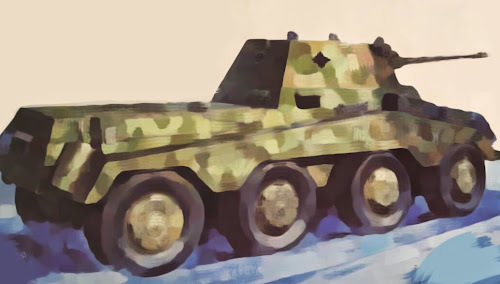 It is armed with a capable 50mm L60 gun, so for an armoured car, it can give an enemy a run for its money, though its thin armour demands thoughtful deployment. The Russians had massive forces for this offensive and they had destroyed much of army group center by the end of the campaign, but here in this small scenario, we are in a corner of the battlefield where there is a contest and a tension for both sides as a race develops for the Soviets to secure the sector and for the Germans to breach it. 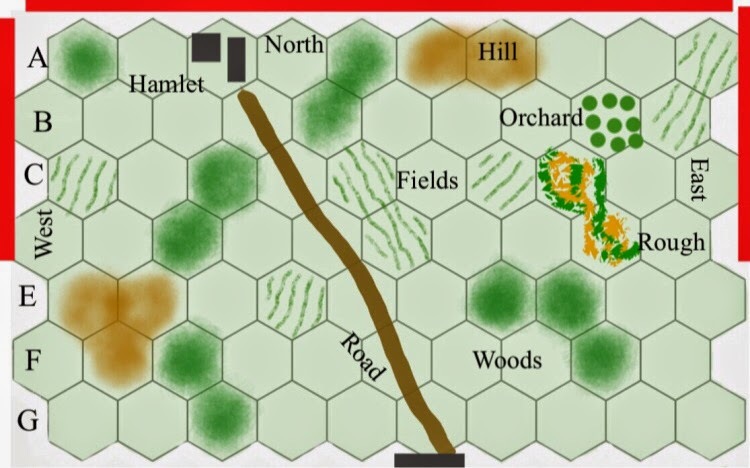 The scenario also gives us an opportunity to use our enlarged battlefield, so we will be playing on an area that is 10 hexes wide by 7 deep (rather than the usual 8 wide by 6 deep). Winning. The Germans get 1 point for every half track exited off the northern edge of the board and 2 points for anything else exited. The Soviets get 1 point (max) if they manage to get an eastern AND western arrival unit to move onto the road (anywhere on the road is fine, they do not have to meet at the same location or be on the road at the same time, they simply have to reach it from their respective sides). The Germans win if they accumlate 4 more points than the Soviet player (who will have either zero or 1 point). Any other result is a Russian win. Setting up. The Germans start off board, entering the game on the road at G6. The Soviets can set up anywhere in rows A to F and decide to deploy in the hamlet and in the fields to either side of the road to prevent the Germans dashing up the road (there is unlimited road movement allowance when moving out of the line of sight of an enemy). The artillery observer is placed on the hill at E2, as the location gives the best views and the observer gets a +1 for accuracy rolls when on high ground. As Player 1, The Germans advance onto the board at G6, they have no choice in the location of arrival. The panzer grenadiers have to arrive mounted in their half tracks. The Puma advances 2 hexes down the road, followed by the PzIVh and StuG IIIg. The half tracks and their infantry remain off the board as as the placement limits on G6 means that only one half track could enter this turn. The game clock dice are rolled and the clock advances 7 minutes. German - everything is in command. 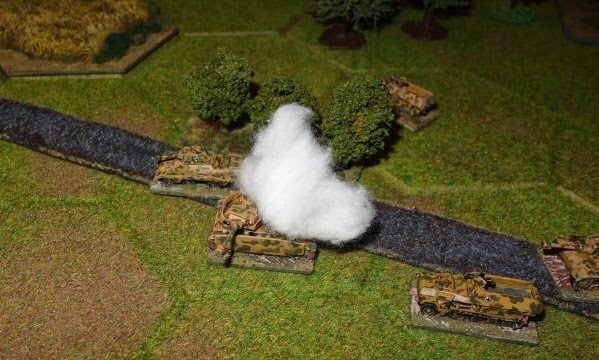 The puma fires at the infantry in the field (E4) and gets a pin result (quite lucky). The Pz IVh moves up to join the puma, but only two half-tracks can enter the board because hex G6 has the stunned Stug there and placement levels would be exceeded as only 3 units can be in a hex at any one time. Russian - Arrival die roll - nothing this turn! Not a great turn, the infantry fail to recover from their pin and German vehicles are beyong the range of the ATR team. The game clock is advanced, but doubles are rolled, which means that both players must roll on the Random Events Table. In this scenario, the Russians always get event number 6 (Air Support) rather than rolling for an event, while the Germans roll as normal. The Germans get 'infiltration' and move a half track off the road to move cross country (see photo below). The Russian air strike gets really lucky (rolling a 6) and takes out the Pz IVh, leaving the vehicle burning and German morale drops by one. German - The puma fires again at the pinned Russians in the field. They get another hit and the defenders are removed from play. Soviet - Arrivals - none! and only the ATR team is in command. The Infantry section from the turn 1 arrivals roll is out of command (again!) leaving it still stuck in the field at A10. 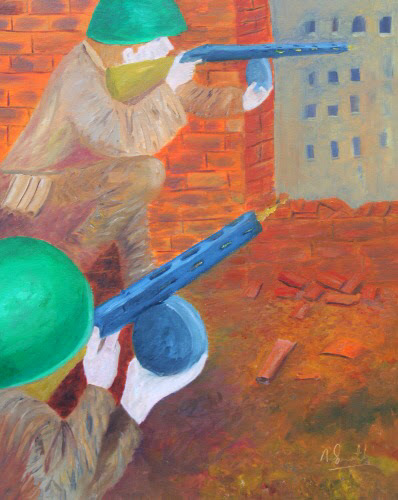 The Anti-Tank rifle (ATR) team fires at a half track, which grinds to a halt and catches fire. The passengers bail out (half track losses do not reduce the German morale rating in this scenario). 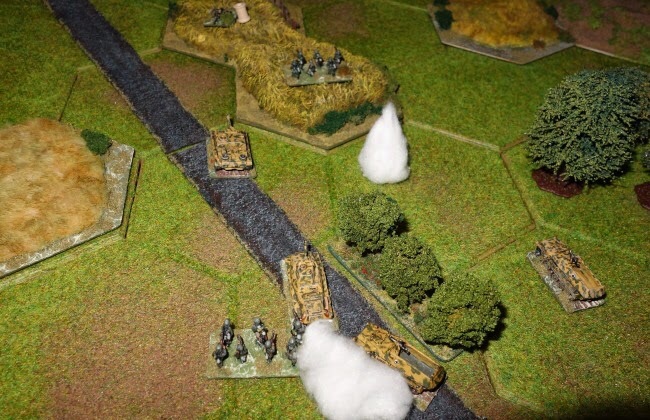 German - The Stug moves forward but the puma hangs back, fearful of the anti-tank rifle team. Instead it fires at them and rolls another 6 to get a pin on the team. The Puma has become the star of the show, no doubt crewed by very experienced people. The panzer grenadiers with the puma dismount from their half track and those grenadiers already dismounted in E6 advance into the lower cornfield (below photo), just below the ATR team. All the smoke created by burning vehicles is tested for removal, none of which disperses. Soviet - Arrivals, a T34/76d comes in on the east edge (at A10). It is not in line of sight of an enemy and fields count as open to vehicles, so it can move a further hex. The ATR team fail to recover from the pin, their days look numbered. German - everything is in command. The grenadiers close assault the ATR team. Happy that this threat is neutralised, they move up the Stug one hex and the puma moves 2 hexes to join it, but they have failed to notice that the newly arrived T-34 (in A8) now has a clear shot into the right flank to both vehicles. The T-34 targets the puma for a more certain outcome and because it is so fast, it will escape them in the next turn. 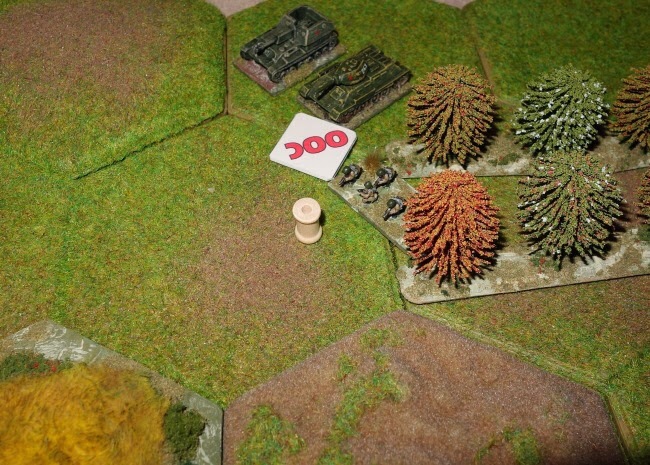 The armoured car instantly burst into flames (putting a smoke marker in the hex). German morale drops to 2. The T34 is marked with an opportunity fire marker and so will not be able to fire again until an action is spent to remove that marker. The panzer grenadiers win their close combat with the ATR team, but that gives them small comfort this turn. Two smoke markers disperse. Below, this is the view from the T34 tank, the plume of smoke confirming the hit on the puma. The flanks of a half track and the Stug are also visible, as are the panzer grenadiers in the field. Soviet - Arrivals, another T-34/76d turns up, this time on the northern edge. They choose to enter at the hamlet, where the Russian rifle section have been out of command since the start of the game. The first T34 simply spends an action to remove its opportunity fire marker. The infantry with them drop down into the orchard (B9) to stay away from the panzer grenadier fire. (The board is again shown below for the convenience of the reader). German - The Stug (in D5) fires directly ahead at the T-34 in the Hamlet. It needs a 4 or less on a D10 to cause harm, which it gets. The Penetration Table awards a 'destroyed but not burning' result. Russian morale drops by 1. Self congratulations are restrained upon remembering that their flank remains exposed to the other T34. The panzer grenadiers in the top field (C5) move up into the woods. Alas for the Stug, the smoke generated by the destroyed puma now disperses, so they lose the cover it provided. Soviet - Arrivals, a SU-76 self propelled gun arrives on the eastern edge. The T34 over there fires at the Stug and gets a stun result. German - At 1040 hours there is a scenario event in which the Germans get two rifle sections as reinforcement and a +1 increase to their morale. The units come into play on the far left (by choice) and being out of sight (hidden by the hill), advance two hexes. This left flank is clear of enemy, so that should give the Soviets something to worry about. 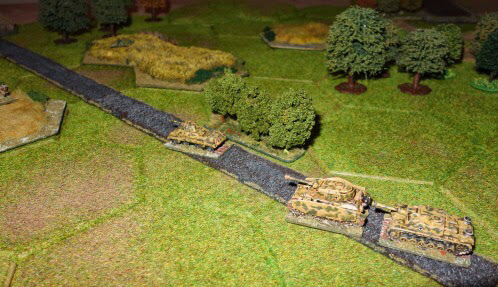 The Stug fails to recover from its stun and the panzer grenadiers that have made it to the woods in B5 make a dash for the open ground in A4. It is either a clear effort to quickly get off the board or to assault the hamlet in the next turn, either way, it was perhaps a folly to advance into the open in full view of the pinned unit in the hamlet - they were bound to fire and even though pinned units only get one fire die, they only need a 5 or 6 to hit ..... which they do, the grenadiers go pinned and the hamlet occupants are marked opportunity fired They now have both an op fire and a pin marker, but next turn will only be able to lose one of them, so they are lucky that the adjacent Germans are now also pinned. Soviet - Arrivals, another T34/76d arrives on the western edge (a sigh comes from the German reinforcements). They cannot risk entry via the woods in case they fail their die roll to enter woods, which would delay entry onto the board, so they come on at B1 and move the two hexes (into B2) because they are out of view. (map reprinted below for the readers convenience). The game clock is rolled for and it advances by 12 minutes. As doubles were rolled, the players must check against the Random Events Table. The Soviets get their automatic air strike, while the Germans roll on the Random event Table and get intensive fire (it removes an opportunity fire marker) but that doesn't help them. So just the air strike is resolved. They attack the pinned grenadiers in A4, without effect. Below - The game positions of units. Top right the Russians have a T34 (that made the flank attacks), a SU-76 and infantry section. Top left the T34 has just entered and is a worry to the two German rifle sections at lower left, who thought pushing up this flank might be a little easier. Next to the hamlet, the pinned Germans have just survived an air strike and need to get into some cover. German - The pinned grenadiers in A4 sensibly dive for the cover of woods in A5 (pinned units cannot advance towards the enemy baseline and can only move into cover). The half track again pins the infantry in the hamlet and the Germans on the left advance onto the high ground. Soviet - Arrivals, nothing. All Soviets are in command. The T34 on the eastern side destroys another half track. The SU-76 fires at the grenadiers in the centre of the map on the road, who can still claim cover from the smoking Stug, but incredible shooting (two sixes) removes the infantry section. German morale drops by one point. The great results by the SU-76 and puma in this game serve to highlight the value that these light sort of vehicles can bring, but they are vulnerable to the bigger guns. There is not enough time left for the Germans to exit enough troops to win the scenario. German - The pinned grenadiers in the woods (A5) recover from their pin. The infantry on the left advance off the hill. Soviet - Arrivals, a SU-152 enters on the western edge at B1. German - The grenadiers at A5 advance off the board (scoring 2 victory points) and on the left, one of the rifle sections advances into the field, the other is out of command and pinned. The panzer grenadiers in E7 (below) are keeping the enemy infantry on the east side tied down, though they are having some problems seeing through the rough terrain. You can just see the Russian eastern positions indicated by the pin marker on the Russian infantry unit in the very top left corner of the below photograph. Russian - Here is a shot (below) of those eastern positions just mentioned - they have gone out of command again! On the western part of the board, the T34 gets a pin on one of the infantry sections. The clock is rolled for and another 12 is rolled (making 24 minutes pass in just two turns), this advances the time to 1125, ending the game - but first, those doubles require that the Random Event Table is consulted. 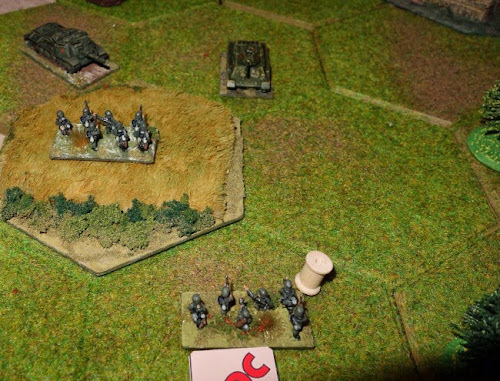 The Germans roll 'ambush' and use their infantry section in the field at C1 to attempt to get a panzerfaust, which they do, destroying the SU-152 and reducing the Soviet morale rating to 2. For their part, the Soviets get their automatic air strike, which attacks the pinned infantry at D2, getting a hit and removing that unit. German morale hits drops to 1. 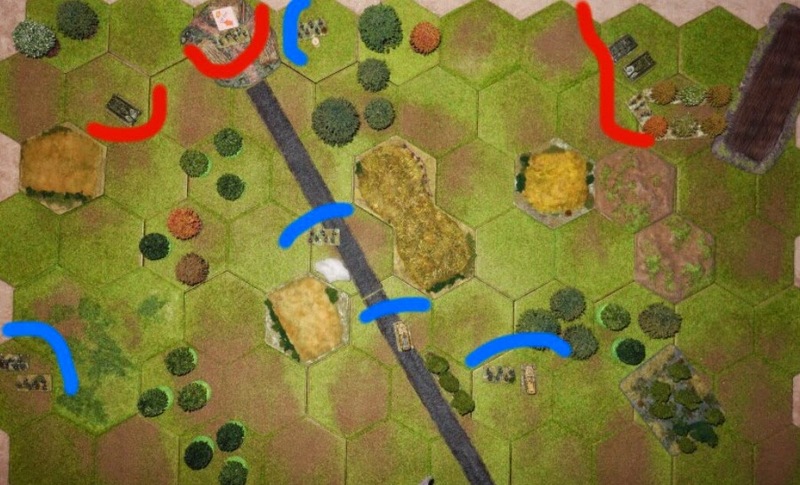 The Germans only get 2 victory points (for exiting the grenadier section on turn 10) and the Russians failed to get arrival units from the eastern and western board edges onto the road, so their point count is zero. The final result is less than a 4 point advantage for the German player so the game is a Soviet win. I really enjoyed playing the scenario, particularly the suspense that comes each turn rolling for Soviet arrivals. The random nature of the Arrivals Table hopefully should keep this scenario both fresh and varied while still producing a fairly balanced game most of the time. The bigger gaming area was fun to use and pretty much takes up a kitchen table width wise. Players might want to add a little randomness in the terrain placement process as some of those lines of sight were critical to the outcome of this game and moving some terrain might help prevent 'favourite tactics' evolving through repeated play of the scenario. I will tweak the scenario slightly by extending the game clock by 5 minutes. As an optional rule, I quite fancy having a roll of '1' on the arrivals table (currently gives a 'nothing arrives' result) give the Germans a Stug IIIg coming on at G6. This would be a one off event, after which time a roll of '1' would revert back to its 'nothing arrives' result. This would just help represent the chaotic situation of a flow of units making for the breakout point. I expect to release the rules, together with scenarios, supportive video links, examples of play and design notes sometime next week. If there is anything over recent months of posting about this project that interests you, then please check back for the next post, there really will be plenty to look at. Thanks to everyone who has been supporting these posts, whether by joining the blog or otherwise, it has helped encourage me to bring this project to a more polished conclusion than might otherwise have been the case. 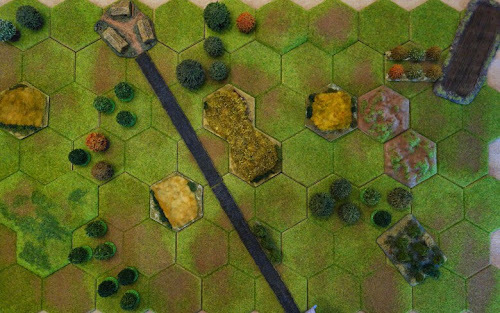 Into Battle (Tactical WWII rules) have been specifically designed for hex gaming within a small area, typically a 2' x 3' space (large pinboard size). The main body of rules is held in 17 pages of fairly large and well spaced text, followed by 3 pages of optional rules that add some nice character to the game. The subsequent pages include unit lists for east front circa 1943 and there are 4 pages that can be printed back to back onto 2 cards for quick reference sheets. The six scenarios include 2 introductory games. One for armour and one for infantry. They all easily play within a two hour time frame. There are extensive design notes and examples, further supported by video link to examples of the main mechanics such as movement, line of sight, close combat and anti armour fire etc. The total package including an index runs to 42 pages. They can be played both face to face and solitaire. Can't wait to get my hands on these rules. Thought the video was clear and informative. Thank you Norm. Russ, thank you for your enthusiasm and encouragement. Your comments and posts have given me much encouragement to move the rules forward and to give a more polished result. Next week, I will post here to include a link tio a downloadable set and also there will be a link to a further 7 or 8 video clips like the one shown here. 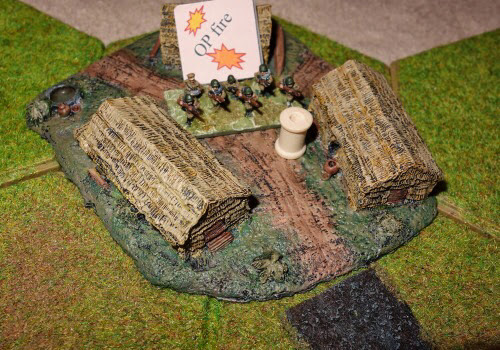 All wargames have a learning curve, but i am hoping the rules have enough example support to get players pastthe first couple of games and then once the system is understood, the more subtle elements of the rules will become more apparent. Not only do you show how you went through the process of making a small board, you also share the process of refining the WW2 rules for the same. I have been following your posts on the rules with great interest and look forward to using them. Although I do have a few rules lined up to play, I will endeavour to bump yours up earlier, even if I will be playing without hexes. Edit: I have been flat out busy for the last few weeks and so have only just got around to reading this post and I note there is a newer one with the designer notes and rules! Hi Shaun, two lots of goodness for you, I know that you are interested in scenario construction, so this post has a bit of that. I hope you like the rules, but even if you don't use them, there may be some ideas in there that take your fancy, but I think the read alone would be worthwhile. If you do get to play them, I would be interested to know how you feel the infantry shape up compared to your own rules since I have the LMG on the section base (rather than split off into 2 squads) and we are using different values on the D6 to hit.